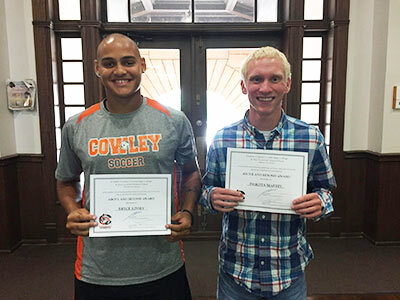 Two criminal justice students were recognized by their peers in class this week for extra effort in helping keep Cowley students and campus property safe during a recent incident. Bryce Kinsey and Dakota Martin received certificates of recognition for their assistance with an incident that occurred on Friday, September 9. During that incident students with the Student Patrol were conducting their routine patrol during the storms that caused localized flooding. While on patrol they located a light pole with live electric lines that had been knocked down by Kimmell Dorm. They also located a second power pole that was about to fall. Student patrol contacted emergency services and kept people away from the lines which were difficult to see due to the dark. During this call they learned that there would be quite a wait for Westar electric to come out. At this time Bryce and Dakota, who are part of the Student Patrol but were not on duty at the time, volunteered to stand in the rain for an hour and half to help their fellow officers and Campus Security direct traffic and keep people away from the scene until the pole could be removed and the lines could be rehung. While it is expected for student officers on duty to serve in this capacity Bryce and Dakota were not obligated to help but they both freely chose to help and donate their time staying until the job was completed.